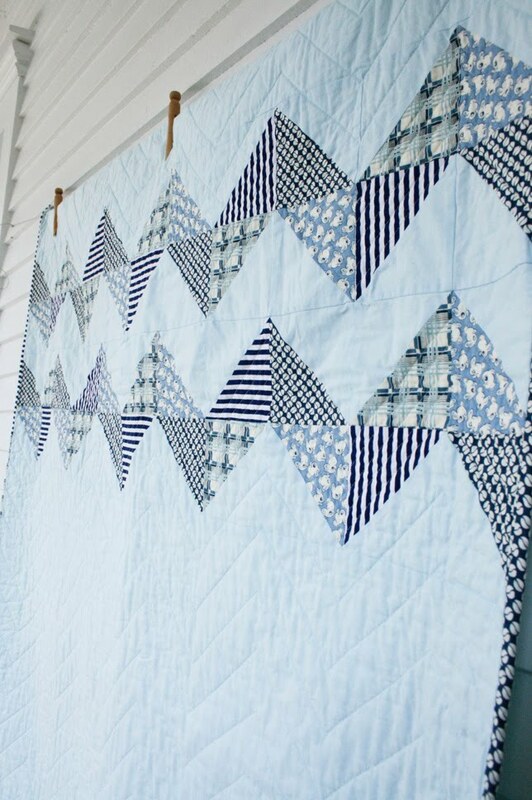 craftyblossom: blue bunny zig zag quilt. 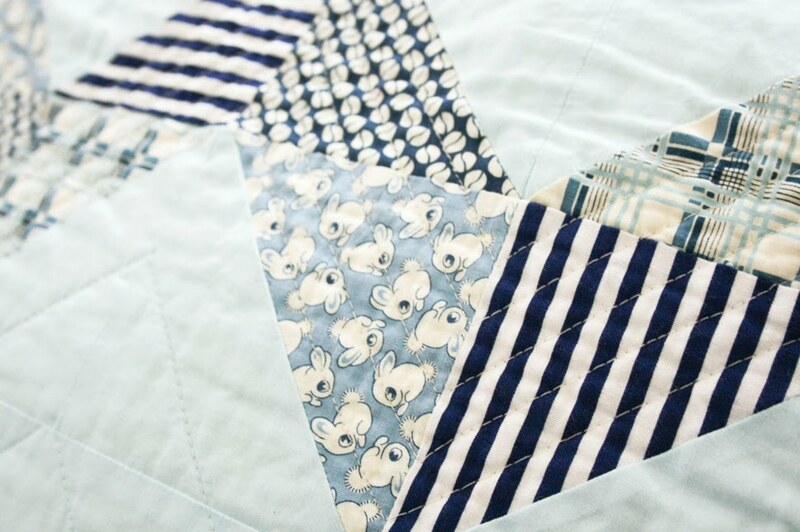 blue bunny zig zag quilt. 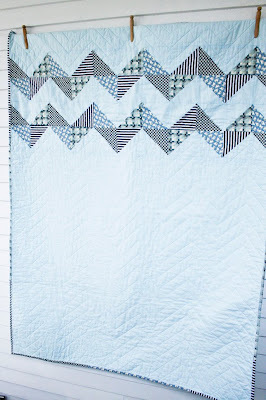 This is the zig zag quilt that started it all. Believe it or not, this is the first zig zag quilt that I made, I completed it over a year ago. Yeah...I'm that bad! I am just now getting around to sharing it. I was inspired by Rebekah's quilt, take a look it's super cute. You know I love the zig zag pattern...it's a nice way to introduce a touch of pattern into a simple design. I love the modern look of the solid zigs too (also on my list of things to make). A few vintage reproduction fabrics. just beautiful! I can't wait to do a zig zag quilt, I'm hoping to go to the fabric store today to pick out some fabrics! What a perfect amount of zig zags! This quilt is so simple and sweet. I just mastered half square triangle trimming (unfortunately AFTER I made a zig zag quilt) so I'm dying to make another one. I always love your zig zag quilts. I really need to make one myself! I love the way you quilted this too. this is fantastic. i love those bunnies!!! the layout here is so pretty. Beautiful quilt & those bunnies are great! beautiful quilt! I am just getting ready to make one of these, so it was fun to see your. yay I'm glad to see you back! I really like how you combine very soft colors with bold colors in the same color line. It works so beautifully! Great quilt - lovely and fun at the same time. You do have the coolest fabrics AND use them so well. love the simplicity on it! is a really beautiful work! Wow, this quilt is really amazing! I love the simplicity of it, and I love the fabrics you put together for the zigs and the zags. That binding ROCKS! Lovely. I'm feeling very inspired. I've just scrolled down looking at all your beautiful quilts. You are very talented! It's beautiful! I love the soft blues. I'm glad I gave that big zig quilt Jon because I don't know that I have another zig zag quilt in me, especially with all of those parallel zigs. You are amazing to make so many zig zag quilts. It is beautiful. I love the colour scheme. Those bunnies are adorable! I still have a zigzag halloween quilt top from last year, waiting to be sandwiched and quilted. I really need to get to that! Love this quilt, the colors are so calming. Very nice! Love it! 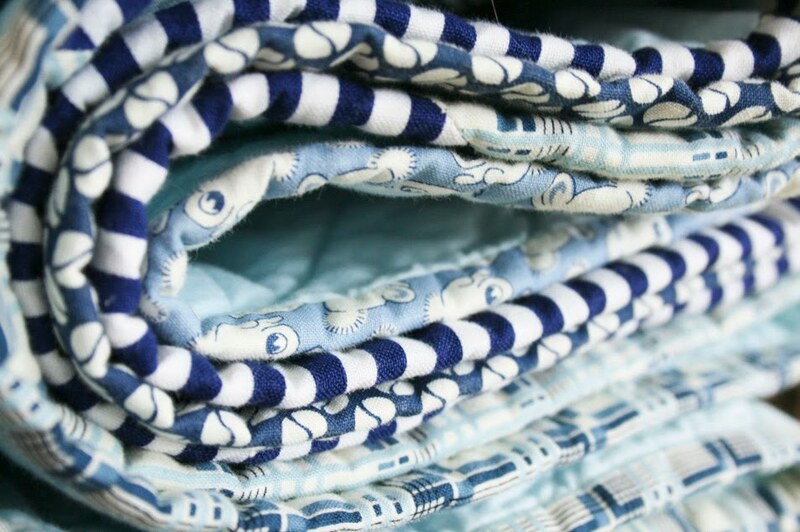 I seriously want to know how you whip up quilts so fast!?! Mine only took a month! And what with all the hand-sewing of the binding... lordy, lordy! Love your patchwork binding. your zig zag is beautiful Erica! you just have such a way with fabrics!